What is the TYPE Function? The TYPE function is categorized under Information functionsFunctionsList of the most important Excel functions for financial analysts. This cheat sheet covers 100s of functions that are critical to know as an Excel analyst. It will return the type of a given value. The function will return a numeric code representing the type of value. As a financial analystCertified Financial AnalystCFI Financial Modeling & Valuation Analyst program is your path to become a certified financial analyst. With 12 required courses on topics ranging from accounting and finance fundamentals to financial modeling, valuation and advanced Excel skills, the CFI financial analyst certification will help, we use many Excel functions in our financial analysisSWOT AnalysisA SWOT analysis is used to study the internal and external environments of a company and is part of a company’s strategic planning process. In addition, a. The TYPE function is useful when the behavior of another function depends on the type of value in a particular cell. 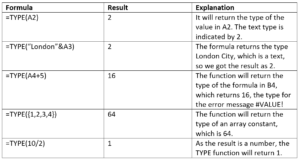 If we are using functions that accept different types of data, TYPE can be used to find out what type of data is returned by a function or formula. Value is a required argument. It is the value to check the type of. So, it can be any MS Excel value, such as a number, text, logical value, etc. 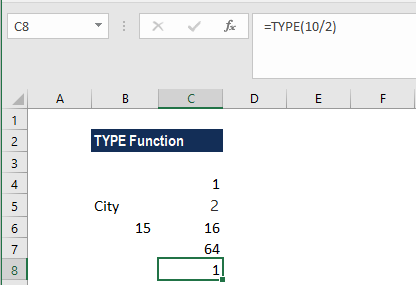 How to use the TYPE Function in Excel? When we test value from a cell with a formula, the TYPE function will test the value returned by that formula. If we refer to a cell that is blank, the function will return the number 1 as result. If we refer to a cell that contains a date, it will return 1 as a result.